Warnie grabbed his notepad and kept an eye on the Fantasy relevant players for Melbourne and Geelong. He was impressed by Dom Tyson’s 114 points. Who else did he like? 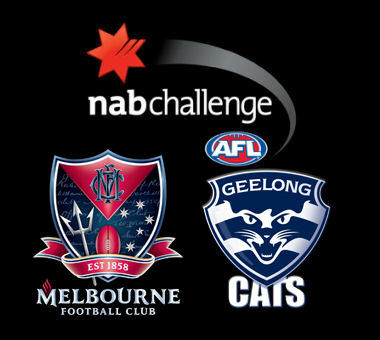 Melbourne Demons v Geelong Cats. Alice Springs. Friday 28th February, 2013. The NAB Challenge is coming to an end with the second last game of the 18 games in 18 days series tonight up in Alice Springs. It was a hot evening, so they did away the subs and the interchange cap. Both teams fielded decent squads, with Enright, Mackie and Stokes rested for the Cats and unfortunately for Fantasy purposes, Jay Kennedy-Harris was rested for the Demons. Early on in the game the Cats lost Joel Selwood (8) after grabbing high at his hamstring. The club called it ‘hamstring awareness’ (WTF?!) and are confident it’s not serious. This was his first pre-season game after being in a moon boot. For me, he’ll be an upgrade target after the bye. The Demons are playing a great brand of Fantasy friendly footy under Paul Roos. After 446 disposals last week, they finished with 444. Their all time record is 454… and as the Freako tweeted, they will smash that this year. Some new Demons were the best with Daniel Cross (126) top scoring and Bernie Vince (101) also among the best, racking up 32 and 34 disposals respectively. Both offer some value for this season, but they’d definitely be risky PODs. Ex-Giant Dom Tyson (114) started in the guts and spent plenty of time on the ball to basically make himself a lock. He scored 56 from just 41% game time last week and this week his 114 came from 29 disposals in 75% TOG. The number three draft pick is almost a no-brainer of a selection at just $218,400. Viv Michie (73) was another cheap midfielder that we have our eyes. on. He finished with 19 disposals and two goals. With 73 from 62% TOG, the $193,900 ex-Docker should also be considered as an on-field cash cow. I don’t have the guts to pick him, but Lyndon Dunn (104) was everywhere. As a defender, he’s reasonably priced at $369,800… but even going with his solid NAB1 score of 83, I wouldn’t even pick him in Calvin’s team. He could be a sneaky slider in draft leagues. Speaking of Calvin, one of his boys, Josh Caddy (121) top scored for Geelong. Enjoying a decent run through the midfield, he collected 29 disposals, 7 marks and 5 tackles to go with his goal to help make the FWD/MID a real option in our forward lines. He’s just $343,500 and we’ll need to be looking for value up forward. I like him. Mitch Duncan (103) isn’t really priced to be an option for the salary cap game, but we will see an improvement. Again, Steve Johnson (90) rolled around in second gear. As the most expensive player in the comp, people are put off… but he’ll be up there as one of the top scorers. At $301,000, Cam Guthrie (45) was massively on our radar for the backline after 95 points in NAB1, but with a tagging role in this match, he may be fraught with danger. He scored 45 from just 8 disposals in 79% TOG. Our boy Jacko Thurlow (71) was solid and we’ll definitely see him play the Fantasy game like the veteran Cat defenders have been doing for years. Hamish McIntosh (28) played his first game in 655 days. He looked rusty but got through his half unscathed. He’s crossed off my watchlist. DEF/FWD Jack Watts (80) could be an option. Roos will play him all over the ground. He spent most of the game running the wings. Calvin must cross Jack Grimes (66) off his watchlist. Whilst I won’t be picking him, Jesse Hogan (65) will be making an impact this year. Throw a few dollars on him for the Rising Star, especially as the other Melbourne big men may miss a few matches this year. Alexis Georgio (55) at $115,200 should be selected as a bench defender if named. He’ll make some cash, but he will be an important heart beat on your bench as the rookie stocks look low at this stage down there. There you have it… it’s been a long week – and really, a long 17 days! Looking forward to the last game tomorrow! We are now under two weeks before the first real game of the season! It’s getting bloody exciting! It’s always a risk. Coming from a Melbourne supporter, you will have weeks where you will celebrate the decision and weeks where you will curse it. The midfield role that Roos has pegged for him will be good in the long term, but it will still take him a little while to get use to it. hmmm, in my opinion calvin shouldnt cross grimes off his watchlist. he made that score from only 58% TOG and considering he is playing the saints round 1, i wouldnt be so quick to cross him off – especially considering we have a free hit in round 1 for fantasy. I agree with ya mate, i’ve got Grimes too, he’s racking up the possessions, just lacking tackles and a couple of marks, btw what’s a free hit? Thoughts on Mitch Brown? Has scored well over the NAB is is quite cheap. Haha. Charles… bit of tongue in cheek there – we’re giving Calvin heaps of crap for picking Grimes. To be honest, not a bad pick… but for me, I’m selecting enough risky players without adding him to my list. Lucas… we haven’t really seen the Cats’ forward line properly yet. Some decent scores, but at $250K, there’s not quite enough upside for me. Warnie, Lynn could well be a great POD particularly with melbourne’s new possession based game. With St.kilda first up and with unlimited trades until round 2 it’s worth taking the risk in my opinion. Another one worth looking at is terlich. Brown can be selected as a $211k defender in classic. If he gets early games, I don’t mind him at that price. Scotty rates him, just always had issues being best 22, but could be a quiet little early money maker if he plays. Still quite a risk though. Hi im am doing a Afl Fantasy Elite Draft league on 7pm WA time need few more people to fill up the league. Geelong definitely a team of interest early on. Going to be a few new faces with the likes of Corey, Motlop, Christensen etc not there early on. Shannon, I actually hoped that Tyson didn’t go that well because I wanted him to remain somewhat of a POD, however he has been too good to ignore. Is he worth considering… well lets see, he is clearly in the best 22 at Melb, will play midfield all day long, is a former top 5 draft pick, is now fully fit, Roos loves him (sought the trade from GWS), is scoring exceptionally well for minutes on the ground during NAB games and is priced cheaper than some first year rookies. Just my opinion but I can’t see too many teams not having him. BTW thanks Warnie for the great write up. Keen to see how much your team has changed now after the NAB challenge series and some of the performances. How did Sam Blease go? Tossing up between him and Nahas as F5? He’s in Melbourne’s best 22. Just don’t know if he’ll get enough ball?